TechCrunch is my favorite business blog. But sometimes their columnists venture into politics and expose themselves as idiot bay-area leftists. 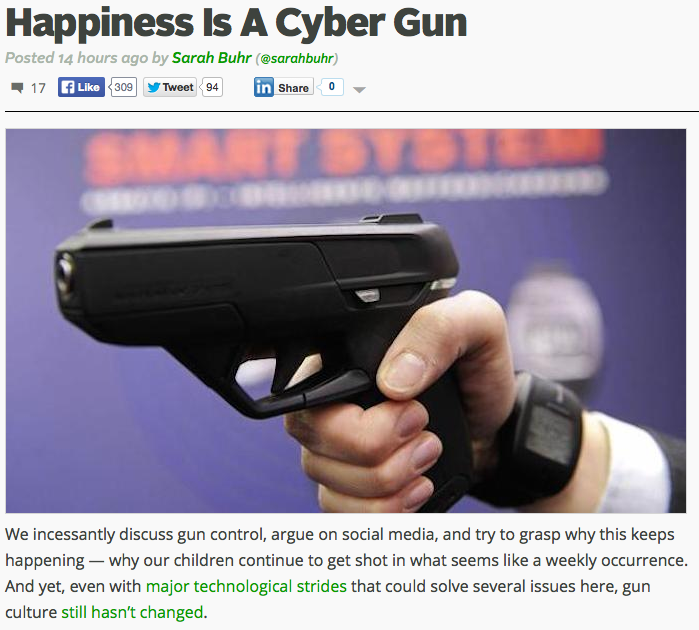 Today's article: Happiness is a Cyber Gun, by Sarah Buhr. Sarah is a leftist who hates guns. But she wants to write an article that shames the 100 million gun owners in America for not adopting the new technology that only allows the gun owner to fire the weapon. When you're an outsider to a market, you make assumptions about that market. This article is full of assumptions. Prominent, that as a gun owner, I would want to trust my life, and my family's life, to a new technology. Defending my life in a violent struggle isn't the same as downloading an app, Sarah. Anyhoo... I left a comment, then saw that Michael Arrington had left one too. Michael is the founder of TechCrunch who sold it to AOL a few years ago. 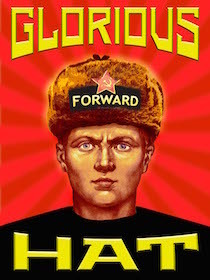 It was after this sale to AOL that these random liberal hit-pieces started poluting the site. No doubt Sarah is sitting in a bay-area coffee house sipping a venti cinnamon frappylactachino right now rolling her eyes and saying to herself, "these close-minded right wingers just don't get it." I'm going to stick with the John Moses Browning technology. Until I'm dead, or I find something better. You mean you're not eager to comply with her whinging demand to embrace the mandating of untested and unproven technology that can't handle anything more than a .22 recoil-wise and can be susceptible to interference? You horrible unenlightened kulak you! The antis don't understand the issues or the current state of technology, don't understand good faith objections to their schemes, don't care that we see their diktats as ignorant and that they will not solve the problems they claim, and they don't care that their demands are unconstitutional. In short, and I'm sure it's a complete surprise to her, gun owners aren't going to change their culture based on the demand of an ignorant know-nothing.